Suppose that you would like to get an email message about system notifications (e.g. SIP extension turns into online or offline), voicemail notifications or call recording notifications in your Ozeki Phone System XE, and you want to specify which details you want to be informed about in this email. The message template feautre of Ozeki Phone System XE offers you a great solution for this problem. You will be able to create messages with some data selected by yourself and according to your needs, and you also can add these messages to any outside line. For example if you want to get same messages just in different languages, you can make it done easily with message template. 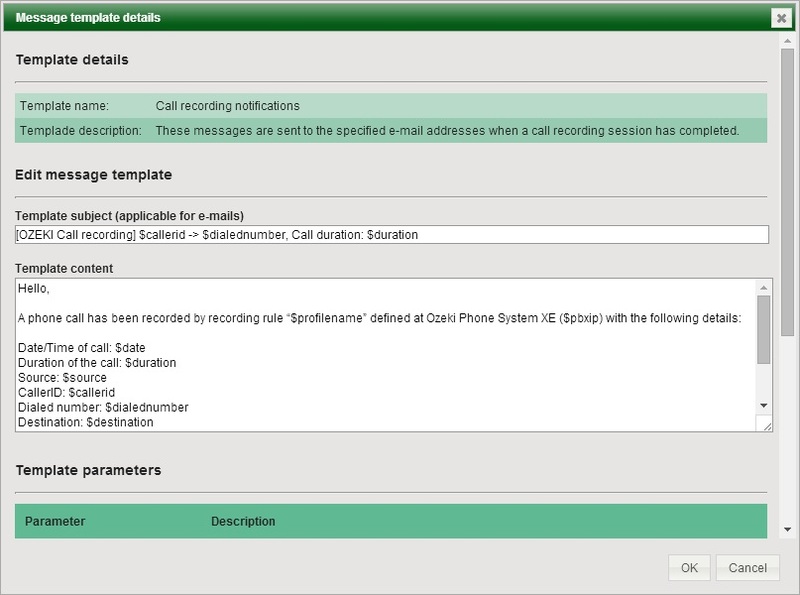 call recording notifications which messages are sent to the specified e-mail addresses when a call recording session has completed. In Ozeki Phone System XE you can add these message template types to any message handling outside line (Email provider, SMS modem, SMPP connection), and you have the possibility to diversify these messages according to your needs. In this article you will get some knowledge about how to setup message templates. You can adjust the message template for every created outside line separately according to your needs. Then you can setup the notifications which triggered the message sending, for example: call recording. After the creation of these settings, the only thing you left to do is creating the message template with data you need. Go back to the main page then open your email provider. Choose the Message Templates option and edit the Call recording notifications. 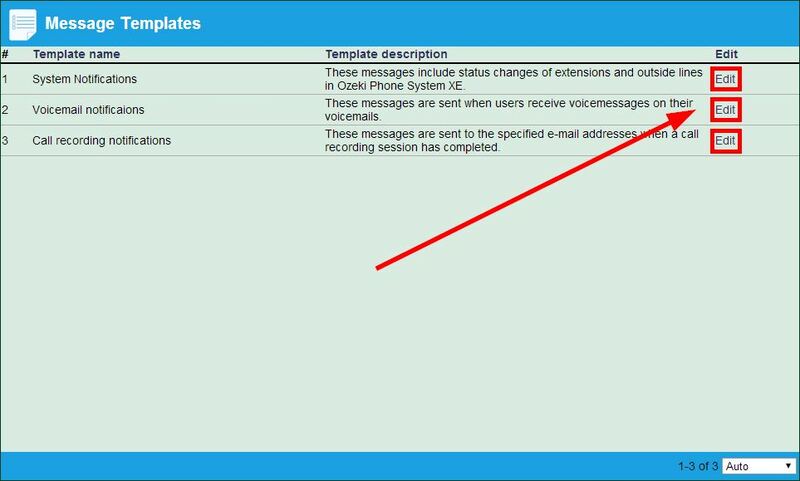 A new Message template details window will come up and - as you can see - there is the standard message which will be sent by Ozeki Phone System XE when a phone call has been recorded by your specified recording rule. Message templates offer you greate solutions for getting email messages about system notifications, voicemail notifications or call recording notifications with those data what you really need for. You are able to add system notifications to any outside line in Ozeki Phone System with unique information.